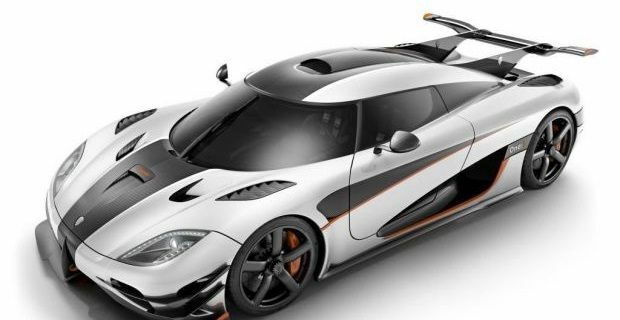 Hybrid-hyper cars like the Porsche 918 and the McLaren P1 might be grabbing all the super car headlines but Koenigsegg have decided that good old-fashioned petrol-powered “mega cars” are the way to go so they’ve unleashed the new Koenigsegg One:1. There’s nothing eco-friendly about this ultimate Koenigsegg. Instead of battery packs and hybrid powertrains, this new machine is powered by a turbocharged V8 that pumps out 1,360bhp. The term “mega car” comes from the fact that it produces over one megawatt of power (a megawatt is 1,341bhp) and the car’s name “One:1” refers to the car’s one-to-one power-to –weight ratio (it’s 1,360kg and it produces the same number of horsepower). All this power means a car that’s capable of a 273mph top speed. So far the engineers at Koenigsegg haven’t been able to test the car’s capability so the 273mph speed remains theoretical. If it can get to that speed, it will be the fastest production car in the world. The new Koenigsegg uses movable wings at the front and rear that increase downforce for the corners and reduce it on the straights. There’s so much grip that you can pull 2G in the corners, which is twice what you’d expect to be able to do in most super cars. Carbon fibre has been used in the car’s construction but Koenigsegg are using a new type that’s 20% lighter than that used on the previous cars. Additional weight’s been saved thanks to parts like the turbo housing and the exhaust tip being produced in a 3D printing machine. Only six of these machines will ever be built. All have been reserved so Koenigsegg hasn’t released the car’s price. We reckon it will be something like 30% more expensive than the £900,000 Koenigsegg Agera R which would mean prices starting at £1.2million if any of the six owners ever decide to part with their Koenigsegg.